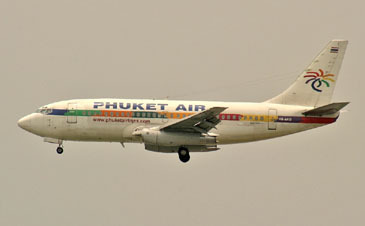 Phuket Air plane 9R602, which has been under seizure since Aug. 19, 2005 returned to Bangkok on Oct. 6, 2005. The plane was seized on Aug. 19 just ahead of takeoff at Incheon International Airport because of debt owed to its local sales company. "We have issued a clearance for take-off following the Thai air carrier took steps for insurance coverage for the plane as well as its crew," said a spokesman for Seoul Regional Aviation Administration. It was on Aug. 19 that a a local court approved the provisional seizure of a B747-300 plane of Phuket Air, which was requested by TV Club, a Korean general sales agent for the Thai carrier. The move came because the airline failed to pay its debts owed to TV Club after it withdrew operations from Korea in August.. It was the first time that an airplane has been seized in the nation. Phuket Air, which operated the Inchon-Bangkok route and planned to start an Inchon-Phuket route in mid-July, suddenly scrapped operations on July 15 without notice. It was then known that the airline allegedly signed a double contract with Japan and Korea. About 5,000 Korean customers who made ticket reservations had to change their vacation plans. The last plane was scheduled to return to Bangkok on Aug. 10. But it could not take off as the airline's subcontractors refused to provide their services and demanded that the carrier pay back the 237 million won in debt. The carrier gave a signed promissory note to the Incheon International Airport authority and paid its obligations. It planned to take off for Thailand at 7:10 p.m. on Aug,19 after receiving permission for operation from the Seoul Regional Aviation Administration. However, the permission was cancelled as TV Club applied for the provisional seizure of the plane with the Incheon District Court, claiming that the airline's unilateral cancellation of the sales contract is unreasonable. The company demanded that the airline pay back a total of 1.22 billion won, including 1 billion won for contract money and some 200 million won it offered to passengers as compensation for flight delays. It also claimed that the unsettled debt will damage travel agencies that sold Phuket Air tickets. According to the ruling, Phuket Air needed to apply for a flight permit after depositing the money with the court. The court ruling was made about an hour ahead of takeoff and a court official arrived just minutes before the plane was set to go. The plane has since been seized at the airport until Phuket Air took proper action against the provisional seizure this week. The breakthrough came this week when a local company known only as "S" company pledged to take over GSA status from TV Club, former GSA for Phuket Air, and agreed to make compensations for eight local travel agents instead.